The kitchen, being an essential part of your house implies enormous attention when it comes to your day-to-day living. It is where your day usually begins preparing a meal for your family. It is also a place where you socialize with your guests and bonds with your family members. So, to have a beautiful kitchen means infusing a healthier and happier family life. To achieve having a functional galley, a lot of kitchen remodeling techniques have emerged to serve as help items to everyone who wants a full kitchen renovation. That said, we’d like to introduce to you the different mobile applications you can download anytime which talk about kitchen remodeling concepts. These home remodeling ideas provide a streamlined approach to organizing and planning your overall kitchen setup. 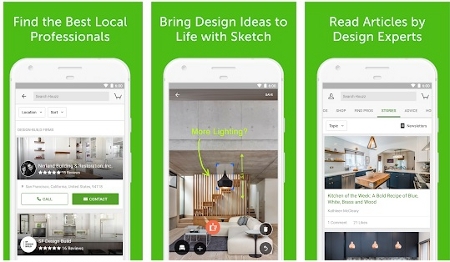 Whether you are remodeling, building, or decorating your kitchen, Houzz App gets you covered. 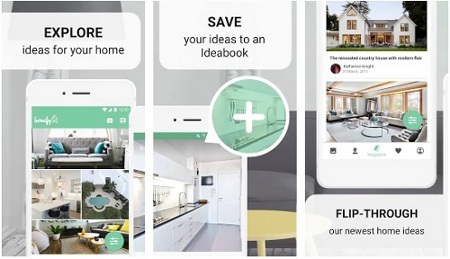 It is an app that allows you to browse 16 million photos in high resolution of home exterior and interior design including your kitchen. You also get an option of discussing kitchen renovation and design topics through the Advise Section which will automatically give you feedbacks if it can work for you or not. There are also guides available for the latest kitchen decorating tips you can apply. Lastly, this app shows you different kitchen renovations materials you can use appropriate for the type of kitchen you have. The app also has a 3D recognition technology wherein you can take photos from your phone’s camera to the kind of furniture you want to shop, and it automatically suggests what suits for you. It is an online sourcebook used for home renovation, kitchen remodeling, and interior design ideas. It comprises of more than 1000 home remodeling photos including the kitchen which comes in carefully edited and selected home merchandise. The Remodelista app also offers the most stylish kitchen improvement ideas which inspire you to create a fresher space. It is easy to browse application allowing you to see influential architectural kitchen design and home product roundups. 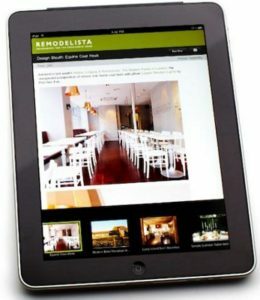 The Modern Kitchen Design (Basenk) App allows every household to see and design a kitchen in a modernized way. It gives out an ideal and contemporary functional idea which fit your needs when it comes to the current kitchen design trend today. In the same manner, it is an efficient app to use for all smartphone users. It aims to provide a more straightforward and more reliable kitchen renovation suggestions that work in any given situation. For example, it incorporates ideas how to put and arrange your kitchen appliances. It also has detailed information and strategies for generating the right layout for your kitchen space. You will also find different types of modern lightings and fixtures you can use to make sure that you see a more sleek and modernized kitchen vibe. The TapPainter is an app you can use to assist you with your kitchen color choices. It is a tool where you have the chance to visualize your kitchen trying different colors before repainting them. It also helps in choosing the right color palette complementing your kitchen lightings. Moreover, it offers a comprehensive and complete range of shades and colors you can choose. You may easily enter a particular color code of your choice. It may also generate arrays of custom colors you can select and best suits for the type of kitchen walls and floorings you have. Homify is the fastest growing architecture and interior design mobile app available to download. You may get easy tips and tricks from different home improvement professionals either you want to build or remodel your kitchen. Similarly, Homify can help you filter the type of kitchen decoration you want. It provides a wide range of images which perfectly fits your taste and needs. You may filter these images from the most popular design, all-time favorite, or even the newest in the market. Lastly, once you have successfully chosen the image of the design you want for your kitchen, you may click it, and you can find its designer’s profile. You can contact and talk to them directly so you can ask whatever questions you may like before applying your chosen design. 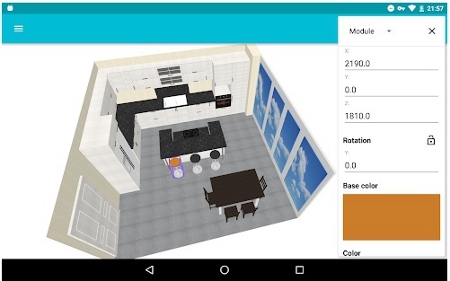 If you dream of becoming an instant kitchen interior designer, then Kitchen Planner 3D must be the best mobile app that can help you. It’s an app that provides the most convenient form of designing your kitchen. Besides, it is a free app that allows you to create a complete kitchen building or renovating project. At the same time, it provides tips on how to properly adjust your installed materials in the kitchen such as cabinets, hoods, doors, windows, etc. Once you’re done creating a kitchen design project, you can both import and export your file to other devices for viewing. You may also share the file via email to your friends, family members, or even to your dedicated architect can access your wants and needs for your kitchen style. It is an app that can give you the latest and best varieties of modern kitchen designs. All the plans you can find in this app would be complete and free. The same with all the other apps mentioned above, you have the chance to choose the design you want and need for your kitchen space. Aside from that, it does not only give you a kitchen design in general, but it particularly suggests designs you can apply to a specific kitchen area you want to improve. It refers to models you can have for your kitchen cabinets, countertops, utensils, appliances, etc. It is undoubtedly a fact that the kitchen is where memories shared on a daily basis. It is the main reason why you should spend ample time creating and maintaining a functional yet appealing kitchen space. So, before you lay down and start planning all kinds of kitchens you may want to incorporate in your overall kitchen space remodel, make sure to properly brainstorm the aspects that you may want to improve and see. Lastly, with the help of the mobile application laid out above in building, designing, and remodeling your kitchen, surely your kitchen renovating job will be a smooth ride.